We Make Wedding Wishes Come True! 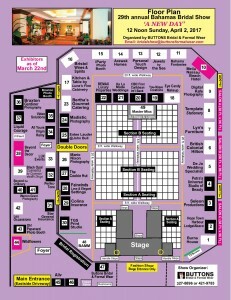 The Bahamas Bridal Show is well-known for making many wishes come true for future brides and grooms. 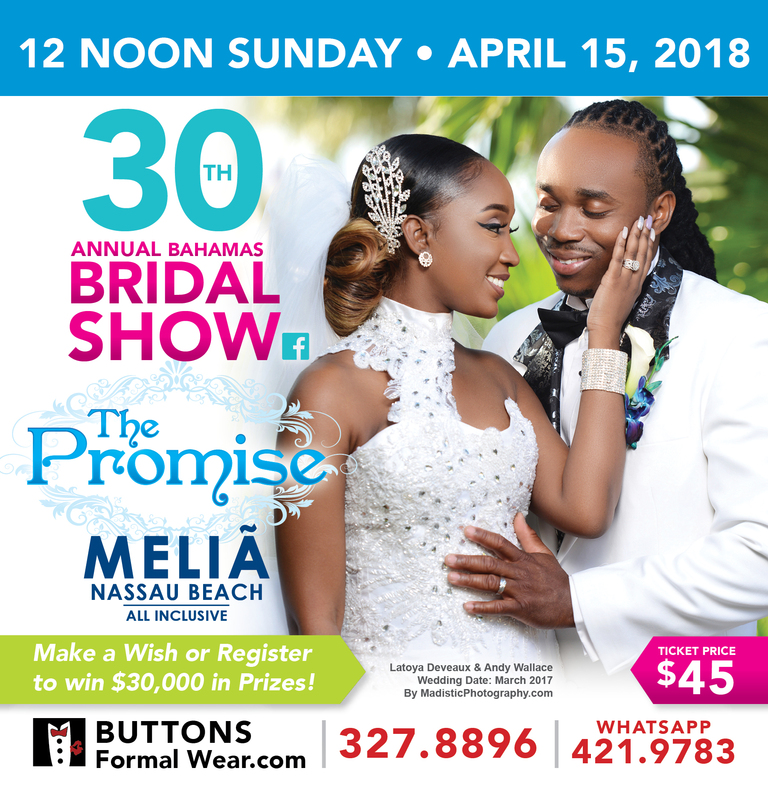 On Sunday, April 15, 2018, the tradition will continue for hundreds of engaged couples at the 30th annual Bahamas Bridal Show at Melia Nassau Beach Resort, Cable Beach. It’s easy to win your honeymoon and other great prizes! 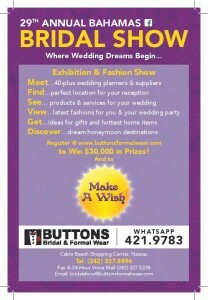 Create your video message and email to bridalshow@buttonsformalwear.com or send to Whatsapp 242-421-9783, revealing your planned wedding date and telling us why you deserve to win your honeymoon. The video must last not more than three (3) minutes and must show faces of each person speaking or appearing in the video. So, take out those cameras and cell phones and start your award-winning video production. 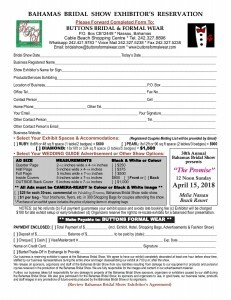 Of course, there’s an easier way to win a honeymoon or other great prizes, such as wedding rings, gowns, photography, tuxedos, decorations, receptions, bouquets, items for your new home and much more! 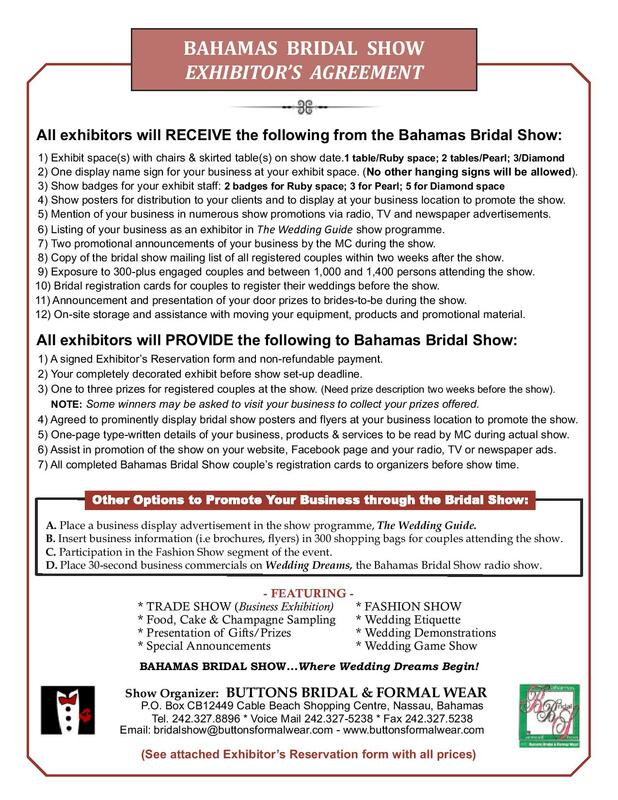 Simply write a letter to the Bahamas Bridal Show announcing your expected wedding date and explaining why you deserve to win your desired prize. 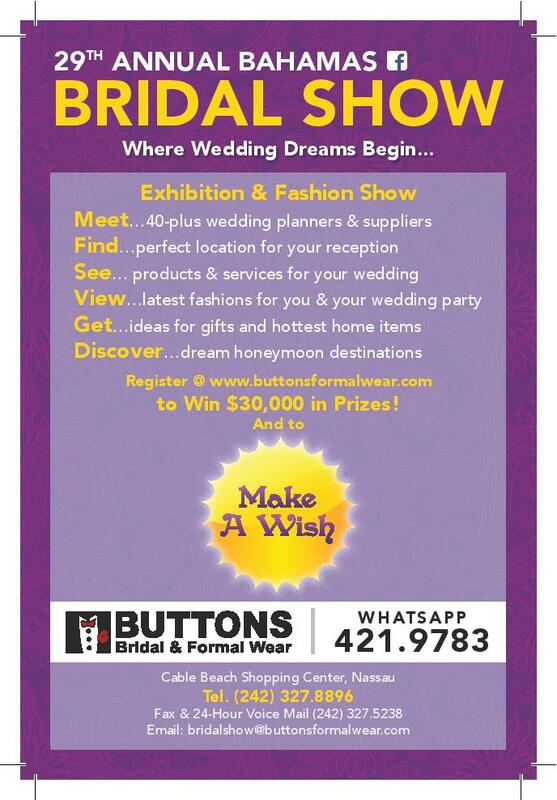 Write your letter in the REPLY box below or send to bridalshow@buttonsformalwear.com, via Whatsapp 242-421-9783 or drop off to Buttons showroom in the Cable Beach Shopping Center. The deadline to submit your video and all emails and letters is midnight Monday, April 9, 2018. 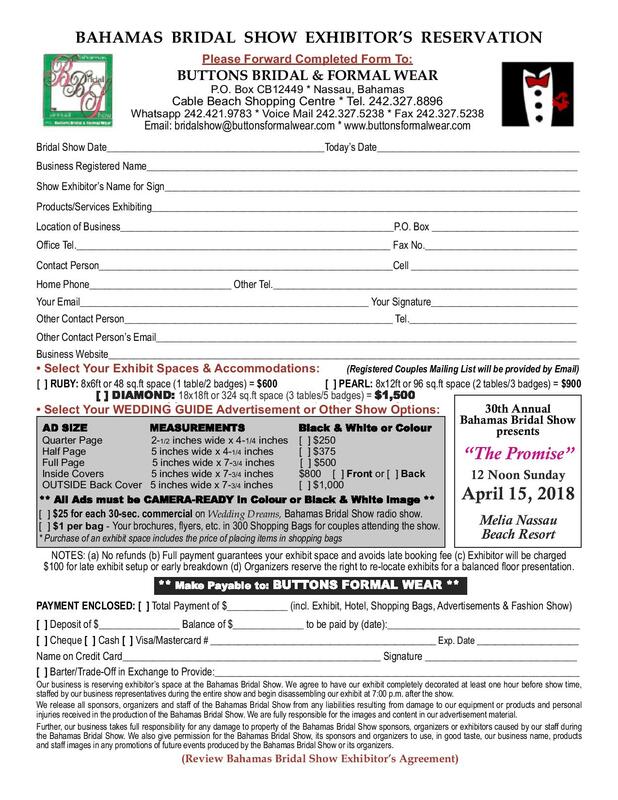 Winners will be announced during the production of “The Promise” at 12 noon Sunday, April 15, 2018. You must be in attendance to win. 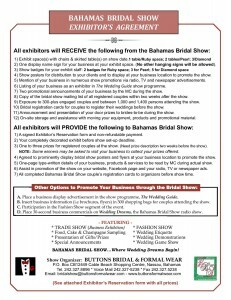 The Annual Bahamas Bridal Show – Making Wedding Wishes Come True! 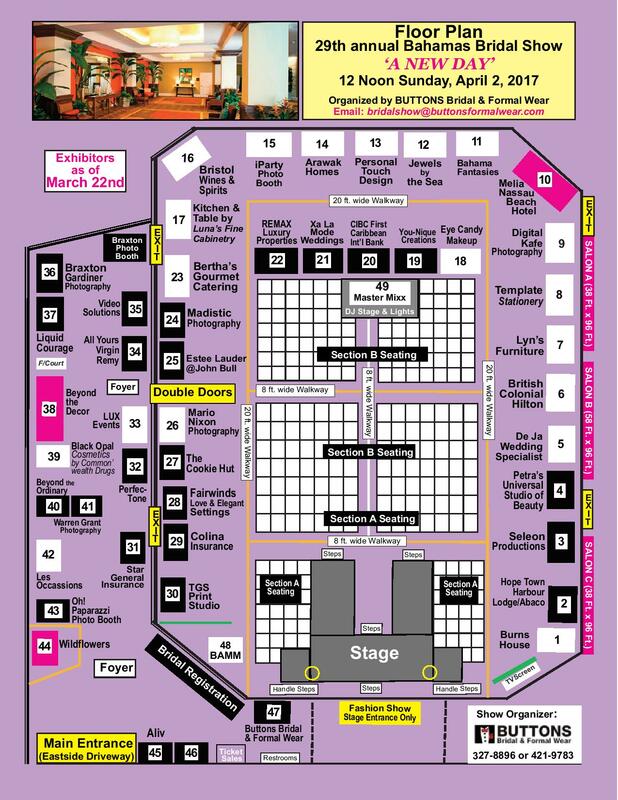 WIN A Honeymoon at 2017 Bahamas Bridal Show! 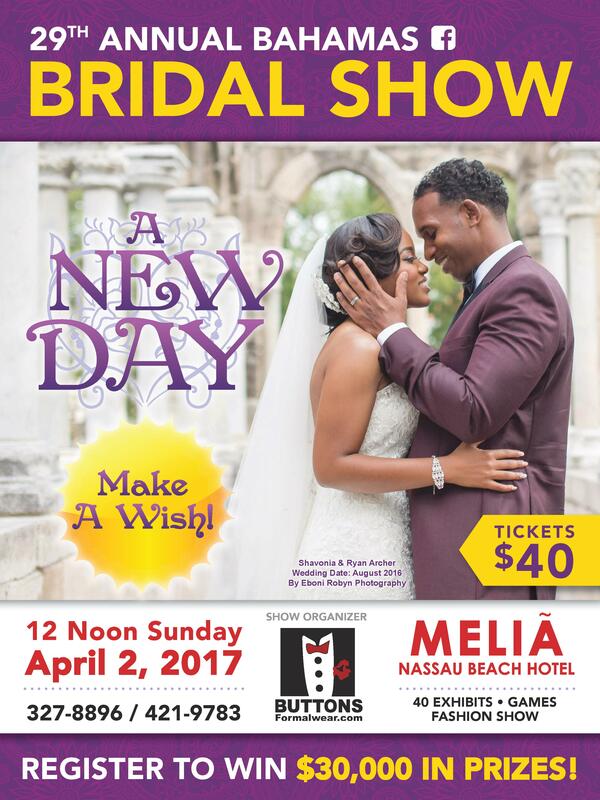 This year, the Bahamas Bridal Show will make many wishes come true. On Sunday, April 2, you can walk away with your honeymoon at the annual Bahamas Bridal Show when the event is held at Melia Nassau Beach Hotel, Cable Beach. It’s easy to win! That is, if you’re creative. Here’s all you need to do. Create your video message and post it on Buttons Formal Wear Facebook page, by email at bridalshow@buttonsformalwear.com or by whatsapp to 242-421-9783, saying why you deserve a honeymoon. The video must last not more than three (3) minutes and must show faces of each person speaking or appearing in the video. So, take out those cameras and cell phones and start your award-winning video production. The winner will be announced during our production of “A New Day” 12 noon Sunday, April 2. You must be in attendance to win. SURPRISE! The deadline for video submission has been extended from Sunday, March 19th to midnight Sunday, March 26th. 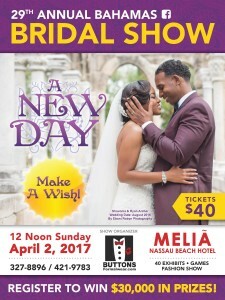 Bahamas Bridal Show Making Wishes Come True!